← 121 "A Star Is Burns"
The couch springs the family off, lodging their heads in the ceiling. "I will not strut around like I own the place"
"Lisa's Wedding" is the nineteenth episode of season 6 that originally aired March 19, 1995. The episode was written by Greg Daniels and directed by Jim Reardon. Phil Hartman and Mandy Patinkin guest star. "Lisa visits with a mysterious fortune teller at the Renaissance Fair who tells of Lisa's future courtship in 2010 with an Englishman she meets at college named Hugh Parkfield." The episode begins with the Simpson family visiting a renaissance fair. Homer eats eight different kinds of meat and an ashamed Lisa wanders off to discover "Friar Wiggum's Fantastical Beastarium." One of his underwhelming creatures, an "Esquilax" (a horse with the head of a rabbit and the body of... a rabbit) runs off into the forest; Lisa follows it and finds a fortune telling booth. Although Lisa is at first skeptical, the fortune teller manages to name Lisa's entire family, and then begins to tell Lisa of her first true love. The story then shifts to an eastern University in the year 2010 (at the time, 15 years in the future) where a now 23 year old Lisa becomes annoyed by a British student named Hugh Parkfield. At first, the two quarrel over a book in the library, but the pair eventually fall madly in love. The two discover they have a lot in common and Hugh invites Lisa to come back to his home in England so she can meet his parents, and is impressed with the Parkfield's manor as well as their impeccable manners. Hugh asks Lisa to marry him and she immediately accepts. The next day, Lisa calls home to tell Marge of the news and Marge promises that she will prevent Homer from ruining the wedding. Marge is still a housewife, Bart (now 25) works as a twice divorced building demolition expert (and plans on going to law school), Maggie is a 16 year old teenager who apparently never shuts up (although she never talks in the episode), and Homer still works at the Springfield Nuclear Power Plant (in Sector 7G, with Milhouse as his supervisor). When Homer mentioned that Lisa is getting married, Milhouse states that Lisa was his 'one true love' and starts to tear up. Lisa and Hugh travel to Springfield, where Lisa is worried that her family will embarrass her, and things get off to a bad start when Bart and Homer accidentally set a British flag on fire. At dinner, Lisa plans on going for a wedding dress fitting, and Homer decides to take Hugh out on the town to Moe's Tavern. Homer presents Hugh with a pair of tacky pig-themed cuff links that Abraham Simpson wore on his wedding day, who then gave them to Homer to wear at his wedding to Marge, and Hugh grudgingly agrees to wear them during his wedding. Later that night, Lisa apologizes profusely for the behavior of her family and although Hugh says it was nothing, he loses sleep over it. On the day of the wedding, Homer meets Hugh's parents and, to Hugh's relief, doesn't act too harshly. Meanwhile, Homer talks with Lisa and she discovers that Hugh didn't wear Homer's cuff links. She finds Hugh and asks him to wear them. He agrees, but says that after the wedding they will return to England and never see her family again. She says that although she complains about her family, she still loves them and calls off the wedding for insulting her parents and siblings. Back in the present once more, the fortune teller says that Hugh returned to England and never saw Lisa again and that there is nothing Lisa could do to prevent it - although she should "try to look surprised". Lisa questions the fortune teller about her "true love" and the fortune teller reveals that although Lisa will have a true love, she "specializes in foretelling relationships where you get jerked around." Lisa leaves the booth and finds her father, who brags about his day at the fair and Lisa listens raptly as the two walk off. The idea for the episode came from James L. Brooks, who pitched the idea as traveling to the future and Lisa meeting the perfect guy, who in turn could not stand her family. Believing that it would be a tough episode to write, the job was given to Greg Daniels, who was enthusiastic about it and has said that was a lot easier and more fun to write than expected The part involving Homer's cuff links was not in the original draft, it was later added because the writer's felt that something was needed to represent Hugh's dislike of the Simpson family. The end theme was redone by Alf Clausen as a "Renaissance version" including a harp. Everything in the episode had to be redesigned, which included new sets and all of the characters had to be remodeled for their age. In most cases, the adults were made heavier, had a few lines added to the face and less hair. On Homer, the redesign was minimal, making him a bit heavier, removing one hair and placing an extra line under the eye, although Homer now wears a different style of white shirt that now resembles George Jetson's. Krusty's design is based on Groucho Marx. The night sky was intentionally made a more reddish color in a subtle joke about how the producers thought the world would be much more polluted in 2010. Nancy Cartwright's Bart voice was electronically lowered a couple of notches. The episode won an Emmy Award in 1995 for Primetime Emmy Award for Outstanding Animated Program. As of March 2018, the episode has a 8.3 rating on IMDb and a 8.9 rating on TV.com. 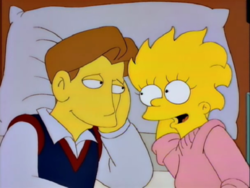 Wikisimpsons has a collection of images related to "Lisa's Wedding". ↑ Daniels, Greg (2005). Commentary for "Lisa's Wedding", in The Simpsons: The Complete Sixth Season. ↑ 2.0 2.1 Mirkin, David (2005). Commentary for "Lisa's Wedding", in The Simpsons: The Complete Sixth Season. ↑ Emmys - "47th Emmy Awards Nominees and Winners"
↑ IMDb - "Lisa's Wedding"
↑ TV.com - "Lisa's Wedding"
Modified on March 4, 2019, at 17:09.